Point S, the international Tire Trading Company, is one of the West's fastest growing tire retail organizations. Point S features top brand tires, at competitive prices and ample stock. The group-buying power allows Point S stores to reduce purchasing and distribution costs and pass those savings to the customers. Featuring all the renowned international tire brands including Goodyear, Kelly, Nokian, Dunlop, Falken, Yokohama, Hankook and more. The Point S Trademark was established over 4 decades ago. Point S Development, the International Headquaters of Point S, was created in 2006, at Lyon, France. Point S group now has stores and dealers in over 32 countries. The sustainability of the brand relies on the capacity to anticipate and adapt to market changes while preserving our professional and human values. As a part of its global expansion plans, Point S has now ventured into India. The Point S concept will be implemented in 5 of India's dynamic states: Delhi, Goa, Punjab, Maharashtra and Kerala. Point S hopes to become the major retail player in the country. Point S have 3500 showrooms across 32 countries. They have sold 16 million tires last year. They plan to increase the number of showrooms in India to 100 by 2020. Apart from tire sales, they are into oil changing, wheel alignment and other related services. In Kerala, the global tire trading company set its first ever showroom at Kakkanad, near Infopark, on 8th December, at 10 am. Mr. Adrian SMIECHOWSKI, the International Business Development Director for Point S group, inaugurated the new showroom. The launch of Point S in Cochin, the global tire trading organization will gain the position of key actor in Indian Automotive Industry. 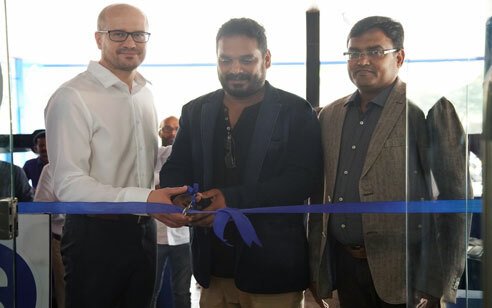 Photo Caption From Left : Adrian SMIECHOWSKI, International Business Development Director, Point S, Kiran M.V, Director, Tyrex India, Sajith Pareethu, Director.